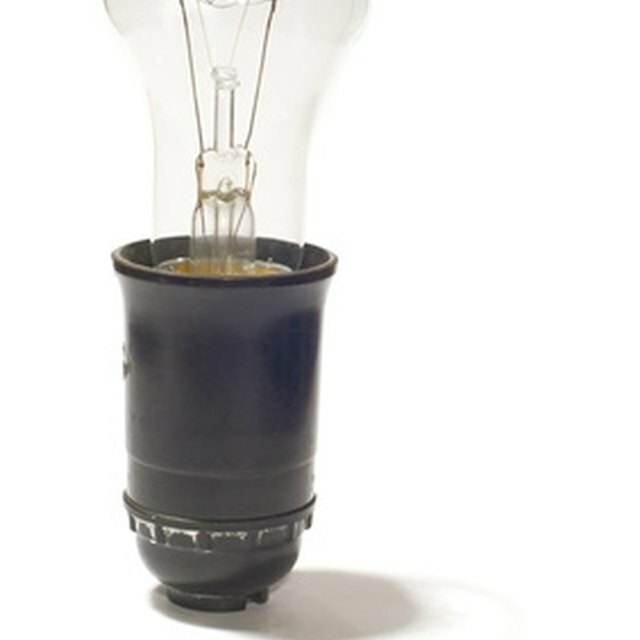 Floor lamps and table lamps typically use the same type of light socket for the bulb. When the light no longer works and you are sure the bulb is not faulty, it might be necessary to repair or replace the light socket. Repairing a socket switch for a floor lamp is limited to a few minor adjustments. If the adjustments do not resolve the issue, then you will have to replace the socket switch. Replacement socket switches for floor lamps and table lamps are available at hardware stores and home improvement centers. Unplug the floor lamp power cord from the wall outlet. Disconnect the shade from the lamp. Depending upon the type of floor lamp you own, the shade might screw off, or there may be a clip you compress to remove the shade from the lamp. Check the light bulb before making any repairs. Sometimes the bulb is not securely screwed into the socket. Turn the bulb clockwise with your fingers. If it was loose, plug the lamp cord back into the socket and try turning on the light. If it was not loose, turn the light bulb counterclockwise and remove it from the socket. Tighten the set screw at the base of the socket with a flat-head screwdriver if the socket spins on the lamp. Usually the set screw works loose, resulting in a spinning socket. Press the body of the socket into the base if it has popped loose. The socket body snaps into the base. Pry the socket body out of the base if the socket does not appear to have damage but the light does not work. Slide a small flat-head screwdriver between the socket base and socket body, and pry the body out of the base. Find the two terminal screws that secure the wires to the bottom of the socket. One of the wires may be broken off from the terminal. Loosen both terminal screws and remove the wires from the socket. If both wires are connected, the problem is most likely a faulty socket, which will require a new replacement socket switch. Loosen the screw that secures the socket base if you're replacing it with a new one. Insert the wires through the bottom of the socket base and secure the new base to the lamp with the retaining screw. Strip off ¼ inch of the plastic insulation from the ends of both wires with a pair of wire strippers. Bend small hooks at the end of each wire. Place the hook ends of the wires around the neck of each terminal screw. Tighten the screws with a flat-head screwdriver to secure the wires. Press the body of the socket with the wires into the socket base until it snaps in place. Screw in a new light bulb and reinstall the lamp shade. Plug the floor lamp power cord back into the light socket. If these steps still do not solve your problem, replace the power cord. Remove the socket as indicated and pull the cord through the bottom of the lamp. Install a new lamp power cord and attach it to the socket as indicated.